Can a machine diagnose patients better than a doctor? 기계가 의사보다 환자의 질병을 더 잘 알 수 있을까. When a patient sees a doctor to treat an ailment, it may take several visits before the clinic finally figures out what’s wrong. There could have been any number of missteps: the initial diagnosis might have been off, the prescribed drug might not have been effective or the patient’s condition might have worsened. 환자가 치료를 위해 의사를 찾을 때 어디가 아픈지 알기 위해 여러 명의 의사를 만나야할 때가 있다. 과정에서 오류가 있을 수도 있고, 어쩌면 첫 번째 진단이 잘못됐을 수도 있다. 혹은 처방 받은 약의 효능이 예상만큼 좋지 않을 수도 있고, 환자의 컨디션이 악화됐을 수도 있다. But with rapid progress in artificial intelligence and its ability to analyze large swaths of patient data, expectations are high that these next-generation technologies will bring significant change in the way doctors do their work - to the point of one day maybe even supplanting them. 하지만 인공지능 기술의 빠른 발전과 방대한 환자 정보를 분석할 수 있는 능력 확대로 의사의 일에도 변화가 있을 것이라는 전망이 커지고 있다. 언젠가는 기계가 의사의 일을 대신할 때가 올 지도 모른다는 이들도 있다. The new technologies will allow doctors to categorize patients using the medical history and genetic information of their family members. Experts believe this will help doctors treat patients more effectively and reduce costs. 새로운 기술은 의사가 환자 본인의 병력과 환자 가족들의 유전적 정보를 활용해 질병을 분류하는데 도움을 주고, 이를 통해 의사는 환자를 더 효과적으로 치료할 수 있고 비용도 줄어들 것이라고 한다. 김진형 지능정보기술연구원장은 “오래 살고 싶다는 건 모든 사람의 바람”이라며 “건강과 의료는 4차 산업혁명으로 인한 기술 발전이 가장 주목하는 분야가 될 것”이라고 말했다. 셜록 홈즈 돕는 왓슨 박사? Today, IBM is the worldwide leader in developing technology for smart diagnoses. The century-old American tech giant started work on a cognitive computing system, which simulates human thought processes, in 2006 and introduced it to the public in 2011 as the supercomputer Watson. IBM은 인공지능과 빅데이터를 활용한 스마트 진단 분야에서 현재 가장 앞서가는 회사다. 100여 년의 역사를 지닌 이 미국의 거대 기술 기업은 인간의 사고 과정을 닮은 인지 컴퓨팅 시스템을 2006년 연구하기 시작했다. 그리고 2011년에 슈퍼 컴퓨터 왓슨을 공개했다. Watson is most notable for defeating two human contestants on the trivia game show “Jeopardy!,” but its real power comes from the device’s potential in health. MD Anderson, the cancer center that is part of the University of Texas, is using Watson as part of its efforts to eradicate cancer. 왓슨은 미국의 유명 퀴즈쇼 ‘제오파디’에서 인간과의 대결에서 승리하면서 널리 알려졌다. 하지만 실제 왓슨의 진가는 건강 분야에서 나타날 것이다. 미국 텍사스대 암센터 엠디앤더슨은 암 정복을 위한 노력의 일환으로 왓슨을 사용하고 있다. The supercomputer was named after IBM’s first CEO, Thomas J. Watson, and the company has billed it as a tool for doctors rather than a replacement. “A modern-day Sherlock Holmes with IBM Watson as assistant - not Dr. Watson,” IBM’s website says. 이 슈퍼컴퓨터의 이름은 IBM의 1대 CEO 토머스 왓슨의 이름을 따서 붙여졌다. 이 슈퍼컴퓨터는 의사를 대체하기 위해서가 아니라 의사들을 위한 도구로 만들어졌다. IBM의 웹사이트에서는 이를 두고 “현대의 셜록 홈즈는 닥터 왓슨이 아닌 IBM 왓슨을 조수로 두게 될 것이다”라고 설명했다. The tech company opened the Watson Health Cloud platform in 2015 to doctors, medical researchers and insurance providers to facilitate sharing of patient data and medical research. IBM had been collecting this data since 2012 and accumulated more than 1.5 million patient records, 600,000 diagnostic reports and two million pages of research papers. IBM은 2015년에 왓슨 헬스 클라우드 플랫폼을 의사와 연구원들과 보험사들이 환자 데이터와 의료 관련 자료들을 공유할 수 있도록 제공하고 있다. IBM은 2012년 이후 150만 명 이상의 환자 기록과 60만 건 이상의 진단 기록, 그리고 200만 페이지 이상의 연구 자료를 축적했다. In Korea, Gachon University Gil Medical Center in Incheon was the first to adopt Watson in 2016. There are now five hospitals, including Pusan National University Hospital in Busan and Konyang University Hospital in Daejeon, that have made Watson part of their arsenal of technological tools. 한국의 경우 2016년 인천 가천대 길병원이 처음 왓슨을 도입한 이래 부산의 부산대병원, 대전 건양대병원 등 모두 5개 병원이 왓슨을 도입했다. Gil Medical Center began treating patients using Watson in December. The suggestions made by the computer matched the hospital doctors’ recommendations for a patient who was diagnosed with stage-3 colorectal cancer. According to the hospital, more than 90 percent of patients who used Watson were satisfied with the service they received. 길병원은 지난해 12월 왓슨을 사용해 환자를 치료하기 시작했다. 왓슨의 소견과 의사의 진단을 통해 환자의 질병을 직장암 3기로 판단했다. 길병원에 따르면 왓슨을 이용한 환자 90% 이상이 만족도를 표했다. “It appears that more people are finding AI more reliable after AlphaGo’s victory over Korean Go master Lee Se-dol last year,” a representative at the hospital said, referring to the high-profile match between a computer algorithm and human Go player last March. 길병원 관계자는 “지난해 이세돌과 알파고의 대결에서 알파고가 승리한 이후 인공지능에 대한 사람들의 신뢰도가 더 높아진 것 같다”고 말했다. 길병원 신경외과 이언 의사는 “암환자들은 진단이 맞는지, 그들에게 어떤 치료법이 가장 적절한지에 대해 알고 싶어한다”며 “왓슨은 진단 실수를 줄이고 환자들에게 최선의 치료법을 제안한다”고 말했다. One of the biggest reasons that many Korean hospitals are starting to use cognitive computing is to get a secondary opinion. For patients, the double confirmation by a human and computer on diagnoses and treatments might put them more at ease. 한국의 많은 병원들이 왓슨과 같은 인지 컴퓨팅을 활용하기 시작한 것은 세컨더리(2차적인) 의견을 얻기 위해서다. 환자의 진단과 치료법에 대해 의사와 컴퓨터가 같은 생각을 갖고 있다는 건 환자에게 훨씬 안심이 되는 일이다. 길병원에서 처음으로 왓슨을 활용한 진단을 받았던 조태현(61)씨는 “왓슨은 수많은 데이터를 연구했고, 그런 왓슨과 의사가 합의한 치료법이기에 더 믿음이 간다”며 “마치 벌써 다 나은 것 같다”고 말했다. Most hospitals using Watson are located outside Seoul, in areas where large medical centers with centralized care are few. 왓슨을 활용하는 대부분의 병원들은 서울시 외곽에 위치하고 있다. 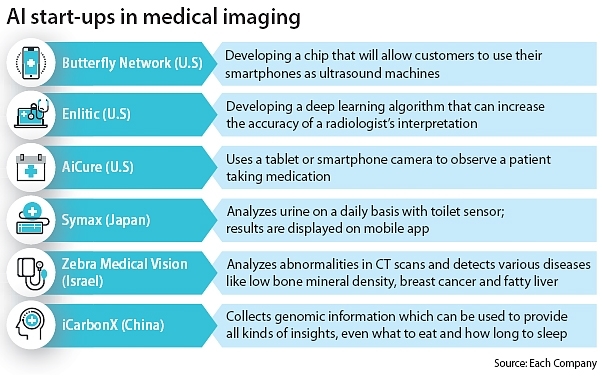 “It has now become unnecessary for patients in rural areas to visit various hospitals one after the other for diagnoses and treatments, largely thanks to the Watson,” said Choi Won-jun, Director at Konyang University Hospital. 건양대병원의 최원준 디렉터는 “왓슨 덕분에 교외 지역의 환자들은 후속 진단과 치료를 위해 여러 병원을 다닐 필요가 없다”고 말했다. Hospitals that have not adopted Watson yet are trying to use other cognitive computing systems to diagnose diseases. 왓슨을 도입하지 않는 병원들 역시 질병을 진단하는 데 인지 컴퓨팅 시스템을 도입하기 위해 시도하고 있다. 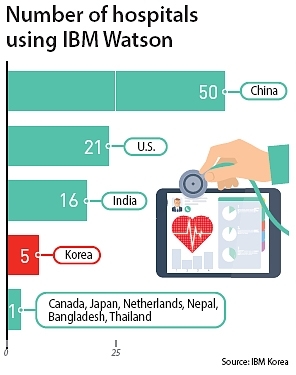 Yonsei University Health System, one of the largest hospital systems in Korea, said it doesn’t plan to use Watson, but it is working on a homegrown cognitive computing system with around 10 tech partners, including Microsoft Korea. 연세대병원의 경우 왓슨을 도입할 계획은 없지만 마이크로소프트를 포함해 10개 기술 파트너들과 협력해서 자체적인 인지 컴퓨팅 시스템을 개발하고 있다. So far, Watson has been used mainly to help diagnose cancer, and the probability of Watson coming up with exactly the same diagnosis and prescription as human doctors varies by type of cancers. 현재까지 왓슨은 주로 암 진단에 활용되고 있다. 하지만 그 진단과 처방의 정도는 암의 종류에 따라 다르다. At Manipal Hospital in India, the chance of Watson coming up with the same diagnosis as a radiologist was high for rectal cancer patients but low for lung cancer patients. The hospital said 78 percent of Watson’s diagnoses of cancer patients were same as or similar to those made by human doctors. 인도 매니팔병원에 따르면 왓슨이 방사선과 의사와 같은 진단을 내리는 비율이 직장암의 경우 높았지만 폐암의 경우엔 낮았다. 이 병원에서 왓슨의 진단이 인간 의사의 진단과 일치했던 비율은 78%를 기록했다. As large hospitals are trying to improve their health care services through AI and big data, many start-ups are developing their own products using the same technology. 병원들이 인공지능과 빅데이터를 활용해 의료 서비스를 개선하려고 노력하는 가운데, 많은 스타트업들 역시 자신들만의 독창적인 서비스 제품을 개발하고 있다. One of these enterprises is Loon Lab, which makes smart menstruation cups. 룬랩은 스마트 생리컵을 만드는 회사다. Established by Hwang Ryong in 2015, the company has developed the world’s first menstruation cup that can diagnose users’ blood and alert them when the cup should be replaced. 2015년 황룡씨가 설립한 이 회사는 세계 최초로 생리컵에 담긴 혈액을 이용해 이용자의 건강을 진단하고 생리컵 교환 시기를 알려주는 시스템을 개발했다. Called Loon Cup, the product can be tethered wirelessly to a smartphone, where users can check real-time information about their menstrual cycle, fluid volume and fluid color. A sensor in the cup sends out a small vibration when it is full to let users know when to change it. 룬랩이 만드는 생리컵 룬컵은 스마트폰과 연결돼 있어 생리주기 및 생리혈의 양과 색깔을 실시간으로 체크할 수 있다. 컵에 센서가 부착돼 생리컵이 가득 차면 알려준다. “I first got interested in researching menstruation because it is something that half the global population has to deal with for half their lives,” the 32-year-old CEO said in his office in Pangyo, Gyeonggi, which resembles a doctor’s office more than a start-up space. 경기도 판교에 위치한 룬랩 사무실은 마치 의사의 사무실 같았다. 인체 모형이 곳곳에 놓여 있는 사무실에서 만난 이 회사 황룡(32) CEO는 “처음엔 전 인류의 절반이 인생의 절반에 걸쳐 경험하는 것이라는 점에서 생리 연구에 관심을 갖기 시작했다”고 말했다. The company was able to attract more than 3,000 backers on a Kickstarter campaign in 2015 and raised about $160,000 though the crowdfunding platform. “People think of menstruation as waste that needs to be thrown away, but I thought, ‘Why can’t it be something like saliva or sweat that can be used to diagnose someone’s health?,’” Hwang said. 룬랩은 2015년 킥 스타터 캠페인을 통해 3000명의 후원자를 모았으며, 크라우드 펀딩을 통해 투자금 16만 달러를 확보했다. “사람들은 생리혈을 내다버릴 쓰레기로 여기지만 나는 ‘침이나 땀 같은 것을 통해 건강을 진단할 수 있지 않을까’생각했다”고 황 CEO는 말했다. Fibroids are one thing that the cup can detect signs of in advance by reviewing the amount of blood and color. 그 컵은 섬유종도 미리 진단할 수 있다. 황 CEO는 나아가 룬컵을 이용해 당뇨와 고혈압 같은 다른 질환들까지도 진단할 수 있도록 한다는 계획이다. 그는 이 세상의 모든 여성들이 병원에 가지 않고도 한 달에 한 번씩 기본적인 건강 검진을 받는 날을 그리고 있다. Another Korean start-up working on AI-based diagnosis is Lunit. The company was established by a team of engineers in 2013 and has been developing an image recognition system that can scan and analyze X-rays to provide medical information. 또 다른 인공지능 기반 의료 진단 관련 스타트업으로는 루닛이 있다. 2013년 설립된 이 회사는 영상 인식 시스템을 개발했다. 엑스레이를 스캔하고 분석해서 의료 정보를 제공하는 시스템이다. The company has attracted about $5.2 million in investment so far and studied about 100,000 X-ray images from major hospitals around the country. Lunit’s technology gets better as the system scans more images in a process known as deep learning. The company says it currently has an accuracy rate over 90 percent. 이 회사는 520만 달러의 투자를 유치했다. 10만 장의 엑스레이 이미지를 주요 병원들과 공유한다. 루닛 측은 더 많은 이미지를 스캔할수록 딥 러닝을 통해 기술이 더 발전하고 있으며, 정확성이 현재 90%를 넘어섰다고 말한다. 루닛의 장민홍 공동창업자 겸 COO는 “우리의 시스템이 의사에 견줄 만큼 발전했다고 생각한다”며 “의사들 역시 우리의 이 시스템이 얼마나 정확한지, 또 얼마나 정확해질 수 있는지 연구하고 있다”고 말했다. At the Tumor Proliferation Assessment Challenge held by the Medical Image Computing and Computer Assisted Intervention Society in Greece last year, Lunit beat Watson and won first place in a contest to analyze medical slides related to breast cancer. 루닛은 Medical Image Computing and Computer Assisted Intervention Society가 지난해 그리스에서 개최한 종양확산진단대회(Tumor Proliferation Assessment Challenge)에서 왓슨을 꺾고 유방암 관련 의료 슬라이드 분석 콘테스트에서 1위를 차지했다. The biggest difference between Lunit and Watson is their purpose. Lunit is different from Watson as it is focuses on image recognition and diagnosis whereas Watson’s focus is to come up with the right treatment. This means Watson is dealing with a wider range of material than Lunit, which only focuses on image recognition at the moment. 루닛과 왓슨의 가장 큰 차이점은 사용 목적에 있다. 루닛은 이미지 인식과 진단에 초점을 맞추는 반면 왓슨은 적절한 치료법을 찾는데 그 목적을 둔다. 왓슨은 루닛보다 더 광범위한 내용을 다룬다. Lunit plans to get government approval to use its software in local hospitals later this year, Jang said. 루닛은 올해 소프트웨어 사용 허가를 받을 계획이다. Meanwhile, a group of Korean researchers led by Sogang University chemistry Prof. Shin Kwan-woo announced earlier this month that they have developed the world’s first personalized medical diagnostic device that people can use at home. 한편 서강대 화학과 신관우 교수는 이달 초 세계 최초로 가정에서 사용할 수 있는 개인 진단 기기를 개발했다고 밝혔다. Here’s how it works. First, a user prints out a piece of paper with lines on it that are made of biological material. Then, the patient puts a blood sample on the sheet of paper, which interacts with the biological material to provide results on diabetes, kidney problems and even brain diseases, according to Shin. 이 기기의 사용법은 다음과 같다. 우선 사용자는 생물학적인 소재로 만들어진 종이를 프린트한 후, 종이 위에 혈액 샘플을 떨어뜨린다. 그러면 그 혈액 샘플이 생물학적 소재와 반응해서 당뇨나 신장 질환, 나아가 뇌 질환 여부까지 진단해준다는 것이 신 교수의 설명이다. Other technological developments around the world might similarly help people receive check-ups without having to go to the hospital. 병원에 가지 않고도 건강 진단을 받을 수 있도록 하는 기술 개발은 전 세계적으로 이뤄지고 있다. In the United States, Butterfly Network, a start-up based on the East Coast, is working on reinventing the ultrasound machine by squeezing all of its components into a single silicon chip, which will allow smartphones to do all the work. The company says 60 percent of the world lacks access to medical imaging because current technologies are unwieldy, expensive and require lots of training. 미국 동부 지방에 위치한 스타트업 ‘버터플라이 네트워크’는 스마트폰에 칩을 심어서 초음파 촬영을 할 수 있는 기술을 개발하고 있다. 전 세계의 60%가 비싸고 숙련도가 필요한 초음파 기술의 혜택을 보지 못하고 있다는 것이 이 회사의 설명이다. In Japan, tech firm Symax has devised a sensor that can be attached to a toilet to analyze urine. The company says its device can detect diseases like gout and diabetes with 99 percent accuracy. The tool is especially popular in Japan, where society is aging at a rapid rate and many senior citizens live in rural areas that are far from big hospitals. 일본의 시맥스라는 회사에서는 화장실에서 소변을 분석하는 센서를 개발했다. 통풍과 당뇨의 경우 99% 감지할 수 있다고 한다. 고령화가 급속히 진전되고 있는 일본의 경우 병원에서 멀리 떨어져 있는 교외에서 거주하는 노인들에게 특히 유용한 기술이다. With technology advancing at such a fast pace, it would not be farfetched to think machines might even put doctors out of business. After all, machination has already hurt traditional industries like manufacturing and retail. But many medical experts argue that artificial intelligence and big data analysis have their limitations and can’t completely supplant the role of a doctor. In fact, these technologies were always meant to be a supplement. 하지만 인공지능과 빅데이터 분석은 한계가 있으며, 기계는 의사의 역할을 완전히 대신할 수 없다는 게 전문가들의 생각이다. 실제로 기술이란 항상 보완적인 역할을 해왔다. Stanford University’s report “Artificial Intelligence and Life in 2030” released last September pointed out that AI-based applications can improve health outcomes and quality of life but only if they gain the trust of doctors, nurses and patients, and if policy, regulatory and commercial obstacles are removed. 미국 스탠퍼드대가 지난해 9월 발표한 ‘인공지능과 2030의 삶’ 리포트에서는 “인공지능에 기반한 기술을 통해 인간의 건강과 삶의 질이 개선될 수 있겠지만 이는 오직 의사, 간호사, 환자들의 신뢰를 얻고 관련 규제와 상업적 장애물들이 사라진다는 전제 하에서다”라고 설명했다. 또 리포트에서는 “최첨단 기술이 있어도 방사선과 의사가 영상을 들여다 볼 것이다. 그 기술의 가치는 아직 그리 강력하지 않다”고 설명했다. 이어 “오는 15년 동안은 완전 자동화된 방사선과학은 현실화되지 않을 것이다. 하지만 최초의 진단이나 보충 진단의 경우 그 속도나 비용 효율성 면에서 개선될 수 있다”고 전망했다. When asked if human doctors can be replaced totally by machines at least when it comes to diagnosis, Jang Min-hong, the chief operating officer at Lunit, said not quite yet. 기계가 의사의 진단을 대신할 수 있을 것인가에 대해 루닛의 장민홍 COO 역시 그렇지 않을 것이라고 답했다. “Various research has shown that machines become as accurate as professional doctors in ophthalmology and dermatology, but diagnosis is not a simple task because it requires reviewing various aspects of the images,” Jang said. “There also is a responsibility issue when machines get it wrong, so I don’t believe machines will replace doctors 100 percent. 그러면서도 그는 “루닛과 같은 인공지능 소프트웨어는 더 고차원적인 영역에서 의사를 도울 수 있을 것이라고 생각한다”고 덧붙였다.